One of my nephews turned 13 this past Friday (13!) & again, I always struggle with what's the best gift or what might be fun to do. I usually try to take them out for lunch or something, but unfortunately he wasn't feeling well this weekend. 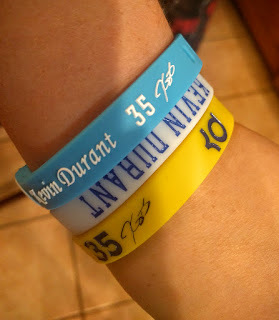 He has Kevin Durant shoes, so he thought these bracelets were pretty cool too - one of them (the blue one) is even adjustable. Every time I see a kid, pre-teen, or teenager I see some kind of silicone bracelet. I think they're cute & a fun form of self-expression. If you are an NBA fan or have an NBA fan in your life, these would make a really cute stocking stuffer or a fun thinking-of-you gift. I like these as they are sturdy, hypoallergenic, & breathable. Bonus: the white bracelet glows in the dark (hello, Halloween!). They also have bracelets for Kobe Bryant, Kyrie Irving, LeBron James, & Stephen Curry (with more to come) & offer a full refund or replacement if you're not happy. I was able to purchase these free of charge in exchange for my honest review. All opinions are 100% my own.